This page consolidates all entries having to do with the town of Bagnoli. There are 13 items running from 2003 to the present and are here below in chronological order and dated. Those entries are still in the pages separately, but they are not linked from the general index. 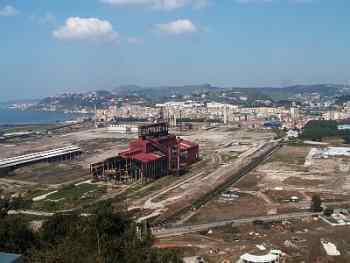 Whatever may become of Bagnoli, today it is still blighted by the abandoned relics of its industrial history. The president of Italy was in Naples yesterday to attend the opening of a new section of La Città della Scienza (The City of Science), a large area—about 4 square miles—in Bagnoli, devoted to the development of a combination hands-on science museum and exposition grounds. The Gulf of Naples really has two bays. In the east, the Bay of Naples, itself, includes—at the far eastern end—Sorrento; then, the towns along the slopes of Vesuvius, the city of Naples proper and the areas known as Mergellina and Posillipo. 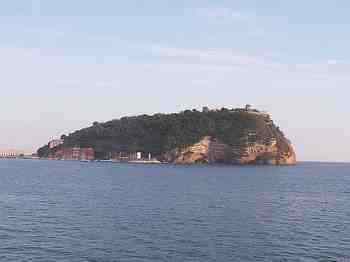 Rounding Cape Posillipo, you come to the other bay: the Bay of Pozzuoli. It is very historic and includes the small isle of Nisida, the town of Bagnoli, the fabled Flegrean Fields, Pozzuoli (with Lake Averno, the entrance to Hell in The Divine Comedy) and Baia, the site of the Roman imperial port. That bay—and the Gulf of Naples—ends at Cape Miseno, directly across from the islands of Procida and Ischia. At the beginning of the 1900s, the eastern end of the Bay Pozzuoli—precisely, the town of Bagnoli and the area running out to Nisida—went through years of extended industrial development. A steel mill was built there as part of the mammoth development of the whole Neapolitan area, a project lasting decades and known as the Risanamento of Naples. The alternative plan—the one that not chosen—involved a quite different approach, architect Lamont Young’s plan that would have turned Bagnoli into a pseudo-Victorian imitation of a British seaside resort. As a result of the extreme industrialization of Bagnoli, the area simply turned into an overbuilt blight of grime, noise, traffic and all those things that one would rather not associate with what is, by common observation, one of the most scenic bays in the Mediterranean. Things changed in the 1990s: they closed the steel mill and started a gradual conversion to a post-industrial local economy more based on tourism. The City of Science has been open since November 2001 and is the cornerstone, so to speak, of the whole plan. It fronts the sea with a beach and small port for pleasure craft. Eventually, the rejuvenation of the area should "ripple" along the seaside past Bagnoli and Pozzuoli to Baia at the other end. It is an ambitious plan, and one hopes for the best. I suppose if Bagnoli had won its bid to host the 2007 America’s Cup, a splendid new harbor in Bagnoli would be well on its way to completion, and that blighted section of the Gulf of Naples would be a bit further along on the path to rejuvenation. As it turned out, Valencia, Spain won the bid, and a new Bagnoli is still struggling to be born— piecemeal, to be sure. It may work and it may not. One has no choice but to be hopeful. When the new Ilva (later Italsider) steel mill opened in 1910, it was the result of nine years of planning and construction. In 1901 it must have seemed a grand idea, a vision of the future; after all, industry was the future. Bagnoli was just one of many places on planet Earth eager to reap the marvels of the 19th century—steam engines, great ships, electricity, tall buildings, new railways, and new-fangled motor cars. (Some even foresaw air travel for the masses—across the oceans in total comfort! Well, they got part of that right.) You needed steel for all that. It is only through the unfair and perfect judgments of hindsight that we want to scream back through time to warn them of world wars, depressions, atomic bombs, post-industrialism and its evil twin, Urban Blight—the abandoned factories, rusted bridges and decaying inner cities. Indeed, at the time, a new steel mill seemed a fine compliment to the then ongoing risanamento of Naples—the tearing down and rebuilding of vast areas of the city to make it clean, spacious and modern. Bagnoli was the perfect place to put that steel mill. The risanamento rejected other ideas for the area, including a plan by the visionary Neapolitan architect Lamont Young to transform Bagnoli into a great seaside resort with trees, sports fields, beaches and grand piers to stroll on. It was too “Victorian” —an anachronism. It is ironic that Bagnoli is now busy trying to transform itself into a great seaside resort with trees, sports fields, beaches and grand piers to stroll on. In decades as an industrial bee-hive, Bagnoli was not just home to the Italsider steel mill, but to other industrial pleasantries, such as a thriving cement and asbestos industry—facilities built in the 1920s and 30s. Yet, as late as the 1930s, Bagnoli was still a resort town, not a bad place to spend a summer. Then, the entire area was bombed in WW2 and finished off by the “scorched earth” policy of the retreating German army in 1943. Italsider climbed back to pre-war production by 1951 and was an important part of the “economic miracle” in the 1950s in Naples. By the 1960s, however, deindustrialization was underway, and decay and industrial blight set in. Italsider closed in 1992, putting 9,000 workers out of work, an economic un-miracle all its own. That was almost fifteen years go. The steel mill has been demolished by now; the ovens and smoke stacks are gone, and acres of Bagnoli are now sitting there waiting for some action. What has happened so far? In 1996, the impressive Science City* opened on the old steel mill property; it is a hands-on science fair directed at the young as well as a convention center for broader needs. And a few months ago, in December 2005, North Pier was opened. 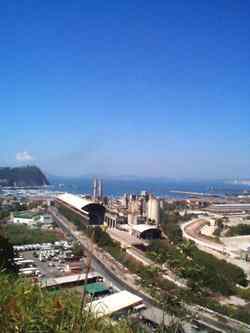 It is the remodeled Italsider loading pier where decades of ships unloaded ore in Bagnoli and took away finished steel. It extends 800 meters out into the Bay of Pozzuoli, such that you can almost touch the isle of Nisida. It is truly a fabled body of water; it is where Ulysses and Aeneas sailed and just across the bay from Cape Miseno and the waters of Portus Julius , the ancient Roman home port of the western imperial fleet. 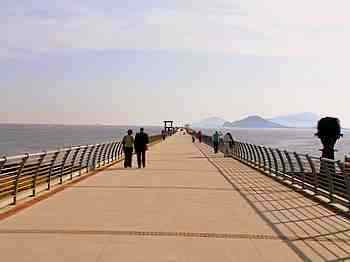 North Pier is renovated and provides a stroll or jog for anyone who wants to get out of what is still the dingy little town of Bagnoli. North Pier is flanked on the west by a thriving private beach and a public one; on the other side, towards Nisida, is the land that was to be the harbor for the America’s Cup. Bagnoli boat harbor—On again/off again. Back in 2002/3, Naples put in a bid for the 2007 Americas Cup boat regatta or race or whatever they call it. Winning the bid would have then entailed building a new boat harbor in Bagnoli, the proposed site for the event. When the Americas Cup went to Valencia (boo! hiss!) and not Bagnoli, I figured that the plan for the harbor—which both I and Leonardo da Vinci had considered bizarre and unworkable— would have been shelved and that Bagnoli would have to limp along in some other way in its very ambitious plan to rejuvenate itself from a century of decay. Recent reports in the paper report that the plan is now "off again", meaning that it had been "on again" even after the Americas Cup idea got deep-sixed. I guess I wasn't paying attention. The concern is for "insabbiamento" of the area. If it were a river, that would be "silting up," so I suppose this is "sanding up." In any event, mayor Iervolino insists that the plan is going to go forward anyway, in spite of engineering and ecological concerns. So that means it's "on again." That, of course, may change. I don’t know if I can digest any more news about the splendid future of Bagnoli, a place that makes the phrase “a totally degraded pit” seem like precious understatement. In any event, the announcement has just come through that, thanks to 76 million euros from European funds, the grand Bagnoli Green Park is on its way to fruition. It’s true that they said more or less the same thing 15 years ago, but this time...just you watch. We’re talking about 120 hectares (almost 300 acres), an area as large as the grounds of the great royal palace of Caserta, much of it on land that used to contain the Italsider steel mill in Bagnoli, all full of trees, flowers, lakes and fountains. Stay tuned. Fifteen years from now, I may have a similar notice for you. 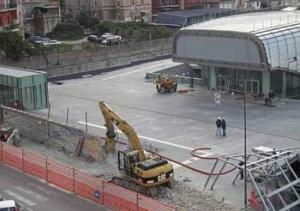 The rise of Bagnoli from the pit of urban decay continues its progress, as painfully slow as it is painfully necessary. A new 300-seat multipurpose auditorium (photo) has just been completed on the vast grounds of the ex-steel mill. 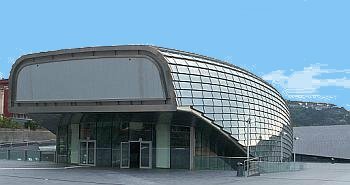 It fronts directly on via Diocleziano, the main road from Fuorigrotta to Bagnoli and is directly across from a stop on the Cumana train line, which should be convenient once the auditorium is inaugurated (this week) and regular activities commence. Bagnoli and the Ruhr. In 2013 the Overseas Fair Grounds (Mostra d'Oltremare) in Fuorigrotta will host something called the "Culture Forum." One of the themes will be the ongoing process of converting the blight of post-industrialism—all the closed and rusted factories, decayed waterfront, etc.—into pleasant bits of suburbia, places of parks, shops, schools and homes where people will want to live and tourists visit. One of the most successful efforts in Europe has been the Ruhr region in North Rhine-Westphalia in central Germany. It is one of the most densely populated areas in Europe and at one time one of the most heavily industrialized. Over the last few decades, "post-industrialization" has taken place, and the Ruhr now has theaters, cultural centers, festivals and museums (including what are now called "industrial museums"). As a run-up to the Culture Forum, a gentleman from the Ruhr, Hans-Dietrich Schmidt, was in Naples the other day to explain the "Ruhr model" to local officials and business persons who would like to use that model for the further development of Bagnoli, once site of the Italsider steel works. Bagnoli has had some successes: a new theater, the North Pier, a hands-on science museum and exposition ground called Science City, a "Turtle Point" extension of the Dohrn Aquarium, a Maritime Museum, etc. There have been failures as well, such as the failure to lure the America's Cup regatta to Bagnoli a few years ago, which would have meant money for the construction of a suitable harbor facility. Some things are still up in the air, such as a proposed Bagnoli Green Park and an industrial museum. I gather from various sources that Herr Schmidt's presentation was a pretty solid pep-talk. You need two things: money and political will. One of those items alone won't do the trick. Both might. More bad news for the city. A fire broke out at around 10 p.m. last night in Bagnoli on the premises of La Città della Scienza (Science City) (photo, right), a hands-on science museum and exposition grounds spread over a large area of about 4 square miles along the Bagnoli waterfront near the isle of Nisida. The facility stands on the area once occupied by the large Italsider steel mill, closed in 1992 in order to renovate the area as part of a gigantic "renaissance" project for this suburb of Naples. Science City was finished about 10 years later. The facility attracted hundreds of thousands of visitors a year and was seen as one of the few jewels in the crown of said renaissance, which continues to sputter. 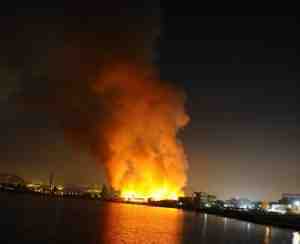 The fire destroyed virtually everything in the main part of the exposition grounds. Most sources say today there is little doubt it was arson. Now that the NATO HQ has moved up to the sunny shores of Lago Patria a few miles to the north, the future disposition of what used to be NATO HQ in Bagnoli is up for grabs, and everybody is grabbing. 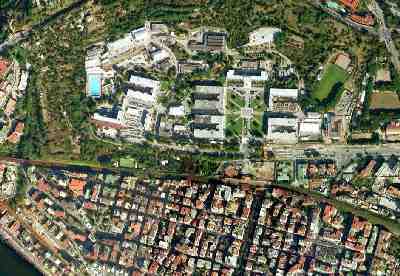 (In the photo, right, the ex-HQ is the 40 hectare (100 acre) green patch in the middle. It is about 1 km from the Bagnoli coast line, visible in the lower left-hand corner). This morning the papers announced that the historic Palazzo Santa Lucia is now up for sale. (It is not far from the Egg Castle in Naples and is historic in the sense that it's from the great urban renewal of 1900 called the risanamento. For decades the building has housed the administrative offices for the Campania region of Italy. There are a few possibilities, and it is not clear if they might exclude each other or whether they might somehow co-exist. One would turn the ex-HQ into a sort of second Centro Direzionale, the new Civic Center in the eastern part of Naples; in that case you would move as many offices as possible from downtown Naples out to Bagnoli in the west, including those of the Campania administration. You would thus, so the reasoning goes, free up such buildings as the Palazzo Santa Lucia for other uses such as hotel space for tourism. Another possibility is to return the space in Bagnoli to about what it was when it started out in 1940. Originally, it was a "Young People's College" named Colleggio Ciano (named for Galeazzo Ciano, Mussolini's son-in-law); it housed and educated about 2,500 boys. The modern incarnation sees it as a giant youth facility including schools, sports facilities, leisure activities, etc. Yet another plan would turn it all or partially into a university. Even more bad news for Bagnoli. After the mob burned down Science City earlier this year, the North Pier was about the only place left that hard-pressed citizens of Bagnoli could rely on to get away from it all. It was a nice 1-km walk (or jog or skip) out and back over the sea. It is now locked. You can't get out there. The sign near the locked gate says "Please excuse the inconvenience, but we are waiting for someone at city hall to start keeping promises." The city of Naples owns 90% of the shares in Bagnolifutura, the company charged with breathing new life into the monster known as Bagnolistein. There are 53 employees who supposedly work to keep the pier-beast alive. They are union members who claim they can't even get put on hold if they try to get through to someone at city hall for some sort of indication as to wages and other niceties. "Uh, he's gone for the day" is about as good as it gets. No future. BagnoliFutura, the company that so many had hoped would play a vital part in the regeneration of Bagnoli a few years ago, has declared bankruptcy and its assets are being sold off. Yesterday, many of the 80 employees of the company demonstrated at the entrance to the BagnoliFutura site in Bagnoli. As recently as last week, there was talk of all the things that could still be done—shops, residences, even a long bridge from the North Pier in Bagnoli across the waters to the small isle of Nisida! To the long-suffering residents of one of the seediest places in Italy, this is just more pie in the sky, various slices of which have been dished up for over 20 years ever since the Italsider steel mill was torn down. There would be boat harbors, green parks, this, that and the other thing. There have been bright spots such as the opening of the North Pier and Science City, but, in between, there has been corruption and mob-driven violence (such as the arson episode that destroyed the first of those two bright spots I just mentioned. Speaking of dreams and those that come to naught, the Bagnolifutura corporation, founded ten years ago in a burst of enthusiasm for the future of one of the seediest bits of urban blight in Italy, was officially declared defunct, bankrupt, kaputt by the Neapolitan courts yesterday. It isn't clear, at least to me, what this means for the future disposition of the properties. I have written 10 or so separate items on Bagnoli in these pages—some optimistic, some skeptical. Bagnoli. It's that time of the year again. Or decade. 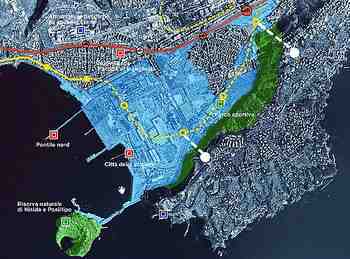 That is, time to mention the future of Bagnoli, that infamous bit of urban blight in the bay of Pozzuoli. There are in these pages more than a dozen mentions of Bagnoli and its agonies. (All the entries are consolidated on this page.) The situation has been going on since the early 1990s and may be coming to a head, although I know I keep saying that. Matteo Renzi, the prime minister of Italy was in town the other day to announce that the federal government (yes, there is one!) is stepping in, saying "Bagnoli is a disgrace. We are going ahead with this, with or without City Hall." He then announced the federal plan to sink 272 million euros into Bagnoli such that the town will be "reborn" in 36 months. (Presumably he meant "sink" metaphorically; after all, they really have been dropping money into the bay, itself, for the last 25 years.) Whatever the case, he and the mayor of Naples, Luigi de Magistris, traded barbs. The mayor took offense at being condescended to by the PM and being invited into the "control room" (studio di regia, a term from TV jargon, here meaning "where the action is"). There was a violent anti-fed protest along the seafront in Naples with injured cops and demonstrators, and passers-by scampering into coffee-shops to escape the tear-gas and more barbs (of wire). Federal interest in Bagnoli is certainly connected to intentions announced by various US companies (including Apple) to open up shop in Bagnoli. Now even Amazon and Google are talking about it. The PM made a pitch up at the juvenile detention center on Nisida (the isle separating the bays of Pozzuoli and Naples). Looks good: new beaches, a new harbor for pleasure craft, a glass pier (a glass pier? ), a new Science City (to replace the one the mob burned down a couple of years ago). Wait, they left out an office building for the mob. That may be a problem.